As the largest manmade lake in Virginia, Smith Mountain Lake is a popular destination for visitors to Virginia&apos;s Blue Ridge and offers many great types of accommodations. Smith Mountain Lake features resorts, condos, hotels, B&Bs, cabins, campgrounds and more for your enjoyment while you relax in the heart of Virginia&apos;s Blue Ridge Mountains. It&apos;s the perfect spot for someone looking for a house rental that offers a waterfront view while still being within close proximity to the mountains. Between the recreation opportunities at Smith Mountain Lake State Park, as well as the fun activities at places like Smith Mountain Lake Farm Alpacas and The Zone Family Fun Center, the family will be kept busy with all kinds of entertainment. The lake also offers opportunities for world-class fishing and boat-rentals through local guides and marinas. It&apos;s also within an hour drive of Downtown Roanoke and the Roanoke-Blacksburg Regional Airport, making it easy to reach from any location in the Roanoke Valley in Virginia&apos;s Blue Ridge. Staying at the lake can be as secluded or convenient as you want it to be. 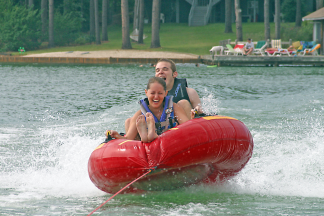 Having a great place to stay is just part of the special experience of a getaway to Smith Mountain Lake. However, it&apos;s a very important part of the experience. And no matter where you choose to stay, you&apos;ll have nothing but fond memories about the time you spent in Virginia&apos;s Blue Ridge. Over 500 miles of shoreline, including waterfront views surrounded by mountains, make Smith Mountain Lake the "Jewel of the Blue Ridge."